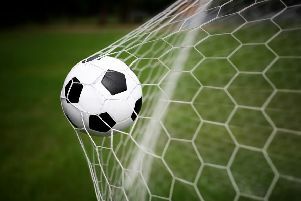 Midhurst got back to winning ways with a scrappy 2-1 victory over Storrington taking their recent points tally to seven from nine in division one of the SCFL. In boiling conditions both teams were looking to play football but it was the visitors who looked more eager and set the tone with high-tempo stuff. Maciek Kason in goal was rarely tested while at the other end Liam Dreckmann created a couple of chances for Gary Norgate and Joel Stevens but they were unable to convert. Unfortunate circumstances gave Storrington a 1-0 lead. Michael Johnson, playing at right-back, intercepted play in the Stags’ 18-yard box. An innocuous-looking back pass to Kason hit a huge bobble, deceived the Stags stopper and trickled into the net. Midhurst probed for an equaliser but a resilient Storrington held strong. Lewis Hamilton had a free-kick go marginally wide, while Dreckmann and Stevens remained a threat on either wing. The equaliser came on 37 minutes. Good play in central midfield from Rich Carter and Kieran Carter allowed Jamie Hill at left-back to set Dreckmann free. A dangerous ball into the box found the head of Joel Stevens whose header made its way to Norgate. The striker’s header was cleared off the line but Norgate reacted quickest to power home. The second half saw Midhurst having their share of possession with Hamilton, Rich Carter and Kieran Carter making their mark in central midfield. Storrington remained a constant threat but Johnson, Fewell, Behan and Hill looked a solid unit and were covering each other well. Fewell looked to have given the Stags the lead on 65 minutes. A free-kick from Behan was headed in by the centre-back only to be disallowed for offside. Oli Lee came into the fold on 70 minutes and made a massive impact with his direct and fast attacking play. The winger set up the winning goal on 77 minutes. Dreckmann fed Norgate, who set Lee free. With a jink past Storrington’s right-back Lee delivered a ball to the back post and found Dreckmann lurking free to smash home. Tom Merritt-Smith had a chance of another in the 92nd minute. The winger brought a high ball down and hit a ferocious shot towards goal. A smart save from Storrington’s keeper prevented a third Stags goal. This was not convincing but the three points were useful from a difficult fixture. Midhurst: Kason, Johnson, Behan, Fewell, Hill, K Carter, Hamilton, R Carter, Dreckman, Norgate, Stevens Subs: Merritt-Smith, Giles. It’s difficult to find many positives from a game played on a pitch in poor condition in temperatures in the mid-20s. The football played was certainly not for the purists. Selsey, with key players unavailable, began slightly the better and scored on 15 minutes with their first shot on target, Ryan Morey finishing well from just outside the box. The home side tried to respond but were restricted to long-range efforts, one of which grazed the outside of a post – which was the closest they came to shot on target in the first half. The second half was pretty dire. Both sides resorted to long-ball football in a bid to beat the playing surface. But neither side was able to create any clear-cut opportunities. With just five minutes remaining the home side were awarded a corner which was delivered deep into the Selsey penalty area. An unmarked Billingshurst player scuffed a shot which was heading wide but struck Jordan Stallibrass and trickled into the Selsey goal. The goal and the game were disappointing from a Selsey point of view, as the previous couple of games had been encouraging. The Blues finished their campaign with a 1-1 draw at Wick.